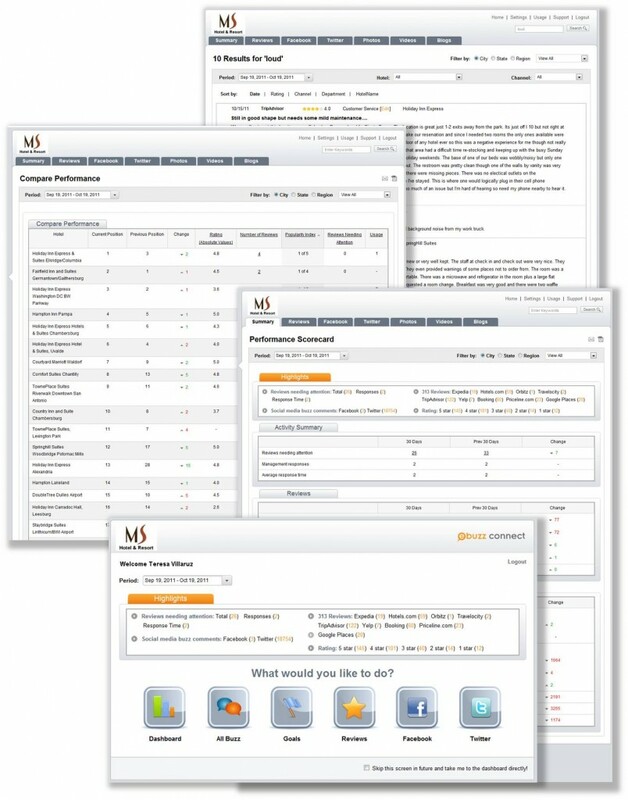 Santa Clara, CA - October 20, 2011 - Milestone Internet Marketing, Inc. is pleased to announce the release of eBuzz ConnectTM 2.0 Group Dashboard with significant feature enhancements for groups and brands. The new high-performance version of eBuzz ConnectTM Group provides a completely revamped, intuitive dashboard allowing brands and management companies to easily view their hotels' social media and reviews performances and compare against the group's top competing brands. Key marketing and sales insights at the group level - identify top keywords, channels, referrers, etc. Because search engines now place high importance on social buzz and online reviews, it is imperative for hotel brands and management groups to have full visual of their hotels' online branding. The purchasing decisions of savvy online users and travelers are highly influenced by their social circles and guest reviews, and eBuzz ConnectTM provides the hospitality and travel industry key tools allowing them to evolve with the inevitable changes in travel search and booking. For more information and to see how eBuzz ConnectTM 2.0 Group can help your brand or management group increase guest satisfaction and maximize revenue, please visit www.ebuzzconnect.com or call 888-350-8396. Click here if you're interested in scheduling a live demo or to request a proposal. eBuzz ConnectTM is an award-winning online reputation management system targeted exclusively at the hotel industry. It provides an integrated single interface for the hoteliers to monitor reviews and social media buzz and to interact with consumers. The tool focuses on driving actions by hotel management to enhance profitability from review sites and social media channels such as Facebook, Twitter, etc. Milestone Internet Marketing, Inc. is a leading provider of internet marketing solutions for the lodging industry. Milestone's portfolio of services includes Hotel Website Design, Search Engine Optimization, Pay-per-Click marketing, Social Media Optimization, eBuzz ConnectTM Online Reputation Monitoring, etc. Milestone currently works with over 1000 hotels and drives over $500M in annual revenue for its clients. Milestone is a preferred vendor for several major lodging industry brands and works with some of the leading management companies. Milestone is also well known as a lodging industry educator for its Hotels to HTMLs internet marketing workshops and book. For more information, please visit www.milestoneinternet.com or call 888-350-8396. If you are interested in attending the workshops, send an email to [email protected].